Not so surprisingly, the right choice of ceiling style is not very clear to most people. You’re confused too, since your ceiling has been there before you even moved into the place. Slapping some paint on it isn’t the end of the story. This is the one thing, after all, that is not only going to protect your home but also make it look gorgeous. Panic not; we’re here to sort you out, with our awesome guide to gorgeous ceilings and safer homes. Acoustic ceilings are ideally used to stifle noises between two floors, which are what makes them the perfect choice for rooms or areas with load music. 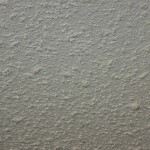 It’s quite easy to identify acoustic ceilings, thanks to their bumpy texture. Their popcorny or cottage-cheesy texture very well manages to complement the rest of the décor and can instantly add drama to an otherwise unflattering room. Downside: They are quite messy to get rid of. 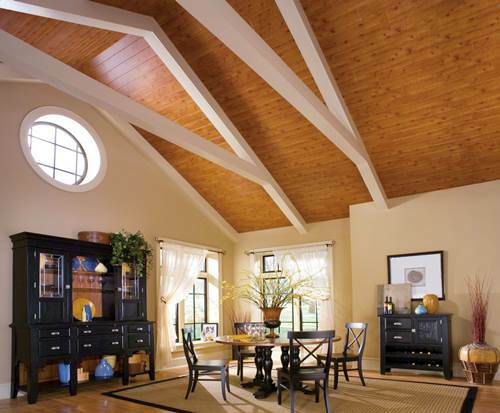 Traditional acoustic ceilings show water stains from roof leaks and create that buckled appearance. In addition, they have quite a low sustainability to mechanical damage too. Drop and false ceiling are other common names for this type of ceiling. You’ll find this type of ceiling in schools, hospitals and other commercial spaces. Although it’s not a very popular choice for homes, since it’s not too big on the beauty front, it works well for the basement or areas where heavy wiring needs to be concealed. Downside: As mentioned earlier, they don’t really score too many points on the aesthetics. 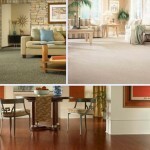 Drop ceilings have also been accused of looking too outdated, boring and cheap. 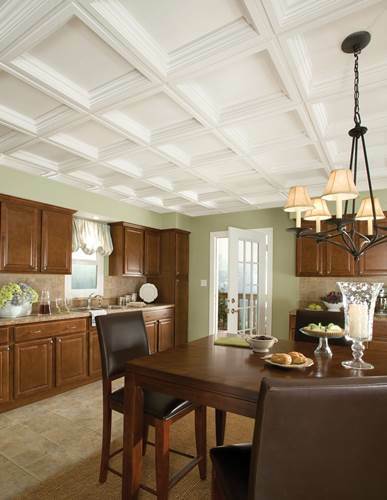 Coffered ceilings are widely preferred by homeowners going for a more old-English themed home décor. You’re most likely to find them in old libraries. Coffered ceiling is the perfect choice for those wanting to add that illusion of height to a room, while making the room look elegant. Downside: Installing coffered ceilings require customization, which is always an expensive affair unless you’ve won the lottery. The name is self-explanatory enough. 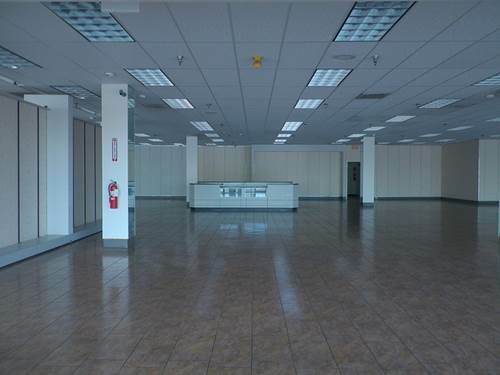 These ceilings are tall and meet symmetrically at an overhead point. Cathedral ceilings are perfect for huge homes, since they singlehandedly add a whole new dimension of drama to the room. Downside: For one, this ceiling works only in case of huge houses. 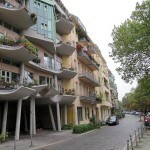 Secondly, it works only if you don’t have additional floors to the house. This takes a lot of functionality away from the house, because if you have that much vertical space, there’s more value in adding another level to it. Thirdly, the room can get incredibly noisy. Tray ceilings go a long way in lending an artistic touch to the room. These ceilings are recessed at the midsection. Tray ceilings give the room an added sense of spaciousness. 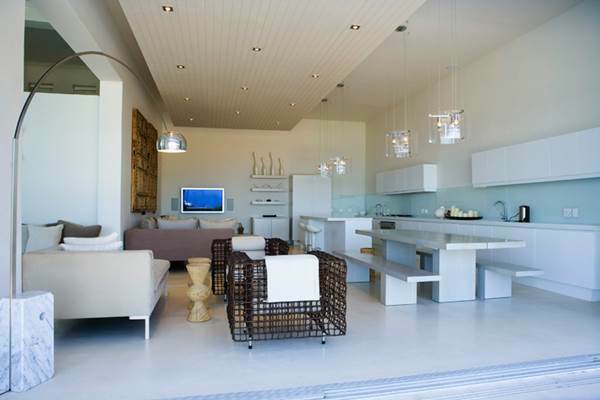 Throw in some recessed lighting or sleek chandeliers, and the room is instantly beautified. Downside: It can be used only in case of higher ceiling space. It might also need you to do a lot of rewiring, which is not only extra inconvenience but extra expense too. Water damage is the most common cause of ugly ceilings. 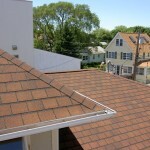 It stems from issues like roof leaks, flashing leaks, ice-damming, condensation, plumbing and HVAC leaks. First fix the root of the issue, find the concealed damage, observe the changes, and then fix the ceiling. 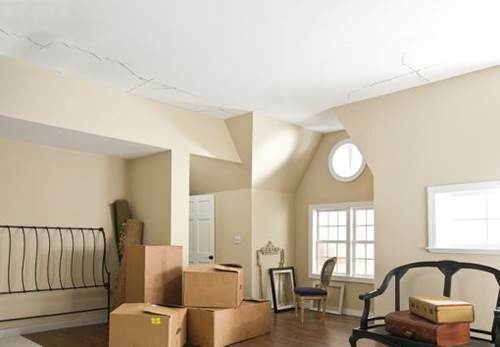 Vibration, wear and tear, aging causes the plaster to sag and develop cracks. Not only is this unflattering, but it’s quite dangerous too. Patch the cracks, and strictly monitor it at all times. This is the grossest thing to happen to your home. Needless to say, molds bring in their fair share of health hazards, which is why they need to be fixed right away. 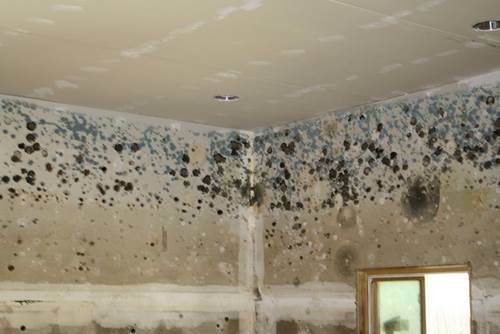 If you find leaks, keep an eye out for mold growth too. 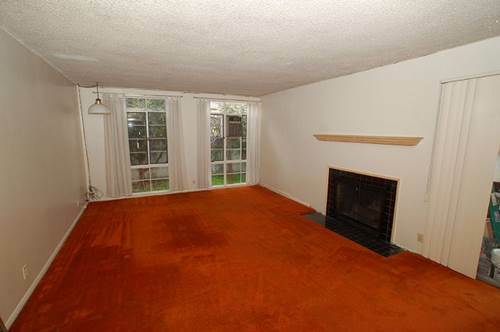 Ceilings are important, but they’re not difficult to tackle. As long as you’re well-informed, updated and have hired the right guys for the job, you should be sorted. Vikram Shenoy, the author of this post, is a freelance blogger and writing for Professional Ceiling Services, experts in ceiling repairs in Perth. 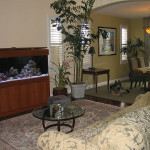 Vikram likes to write about home décor and home improvement projects. You can also follow him on Twitter @ ShenoyTrivikram.